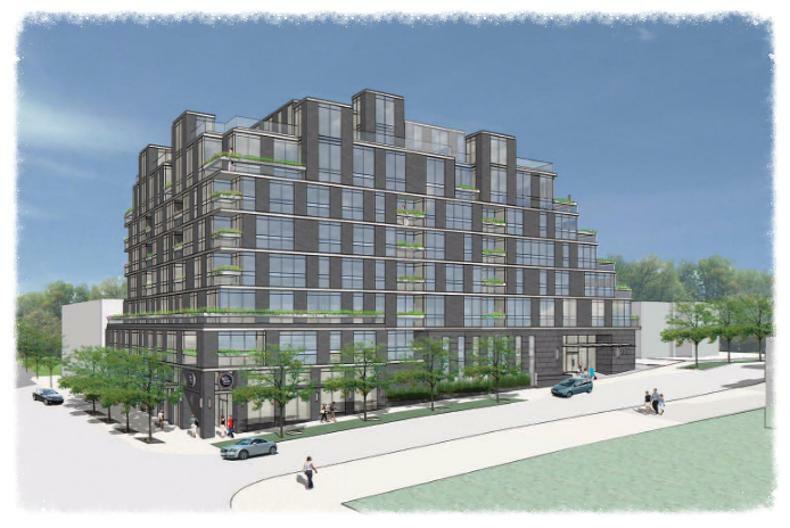 Avenue & Park Condos in Pre-Construction - 7 Storeys & 70 Units! Avenue & Park Condos is a new mixed-use condominium development currently in pre-construction at 1580 Avenue Road in Toronto, Ontario by Stafford Homes. 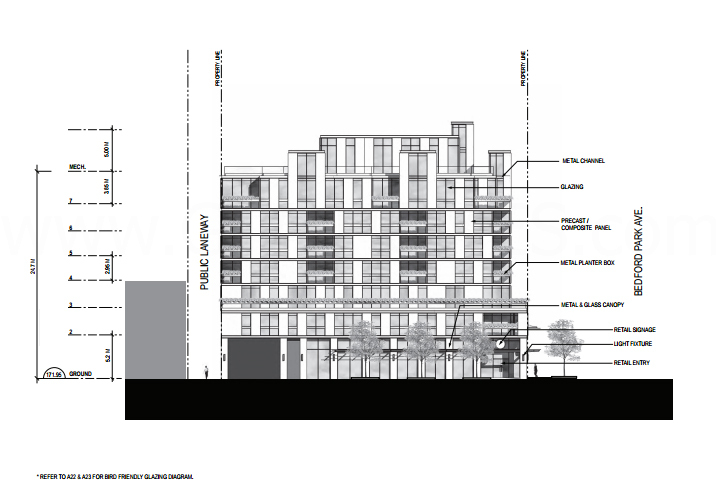 The proposal consists of a seven storey residential building with a total of 70 dwelling units designed by Page + Steele / IBI Group Architects. Avenue & Park Condos is located on the southwest corner at Bedford Park Avenue and Avenue Road which currently holds The Beer Store and their parking lot. The proposal will still include the Beer Store remaining as a tenant but it will have a new "Beer Boutique" look located at ground level. Total residential gross floor area is approximately 7,575 square metres and total retail gross floor area is approximately 725 square metres. 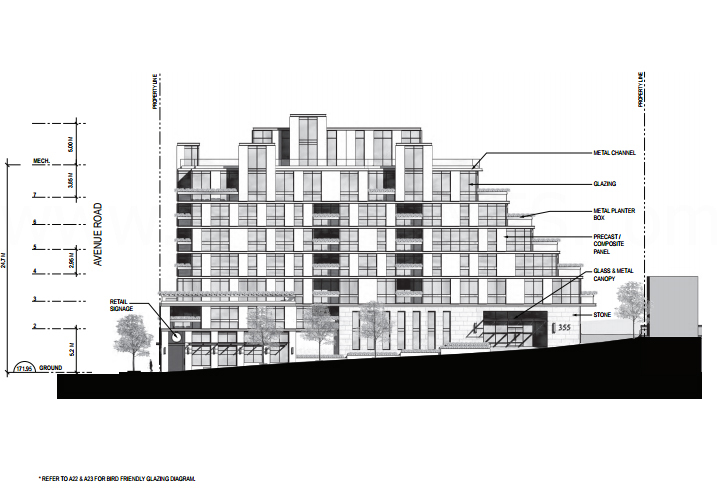 The proposed 7-storey (24.7 metres in height) mixed-use residential building will have a total of 70 units of which 29 will be one-bedroom units, 32 will be two-bedroom units and 9 will be three-bedroom units. There are three levels of proposed underground parking for 129 vehicular spaces of which 102 are for residents of the building, 16 are for commercial and 11 are for visitor parking. Total proposed bicycle parking spots is 53 of which 48 will be long-term and 5 will be short-term. 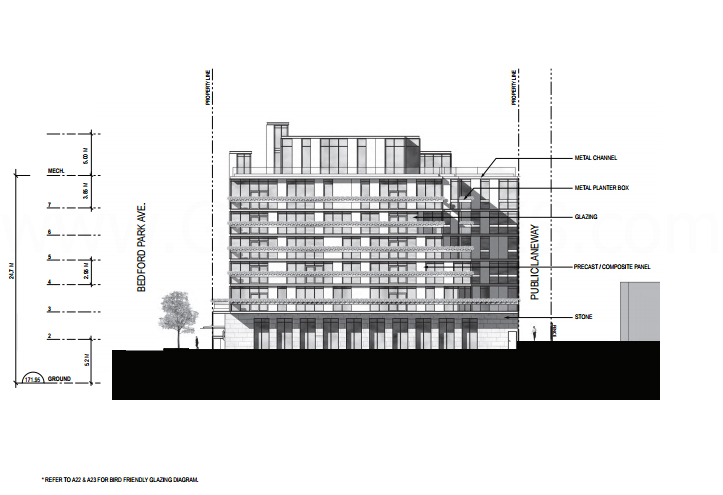 The residential entry into the lobby of the building is proposed on Bedford Park Avenue while retail is off of Avenue Road. Total proposed indoor amenity space 240 square metres and total proposed outdoor amenity space it 237 square metres located on the second floor of the building. Avenue & Park Condos Condominiums is being developed by Stafford Homes who have been in the business of construction, development and property management for over 50 years in Canada and the United States along with its sister company The Goldman Group. This new development is being designed by the award-winning architectural firm, Page + Steele / IBI Group Architects who have won over 30 design awards thus far. Together, Stafford Homes and Page + Steele / IBI Group Architects will collaborate to design and develop the Avenue & Park Condos coming soon to the Ledbury Park/Bedford Park neighbourhood in Toronto. UrbanToronto's Growth to Watch For Series has tracked the hundreds of development proposals and construction projects across the city. Moving from neighbourhood to neighbourhood. Bloor-Yorkville is in their series and its definitely a future growth area to watch for. Read more about UrbanToronto's Development Guide: Growth to Watch For 2016 Series - Bloor-Yorkville. Avenue & Park Condos is located to the north of Lawrence Avenue West near schools such as Havergal College, Havergal College Junior Public School, Lawrence Park Collegiate Institute, Glenview Senior Public School, John Ross Robertson Junior Public School, John Wanless Junior Public School, Blessed Sacrament Catholic School and Ledbury Park Elementary and Middle School. There are also many parks in the area such as the Brookdale Park, the Bedford Parkette, Douglas Greenbelt, Caribou Park and the Alexander Muir Memorial Gardens. The Rosedale Golf Club and the Don Valley Golf Course are situated a short drive away from this new development project. Register with us today for more information on Avenue & Park Condos by Stafford Homes! 1580 Avenue Road Floor Plans and Price List will be available soon. Please call or complete the registration form to get all the info and to register now for the Platinum VIP Preview Sales Event. For more information, please register today for the Avenue & Park Condos.